A complete guide to stye therapy, including signs and symptoms, causes, prognosis, prevention and complications. A stye (medical term: hordeolum) is and inflamed swelling or circumscribed abscess that occurs when a secretory eyelid oil gland becomes infected. 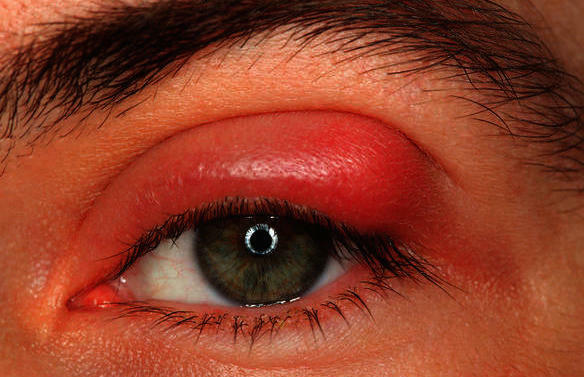 Bacteria infects the oil gland causing inflammation, redness and pain of the eyelid and surrounding tissue—resembling a swollen red bump or pimple. There are external styes and internal styes. An external stye is an infection of the apocrine sweat glands of Moll, or the sebaceous glands of Zeis, and form on the outside of the lids. An infection of the meibomian sebaceous glands, which line the inside of the eyelids, are called internal styes. These types of styes also form a swollen red painful bump that contain an accumulation of pus and water. A stye is caused by staphylococcus aureus bacterium or blepharitis, which is characterized as chronic inflammation of the eyelid. Styes generally don’t cause any lasting damaged, but if the confined pocket of pus is forcefully ruptured, the bacteria can infect nearby oil glands. 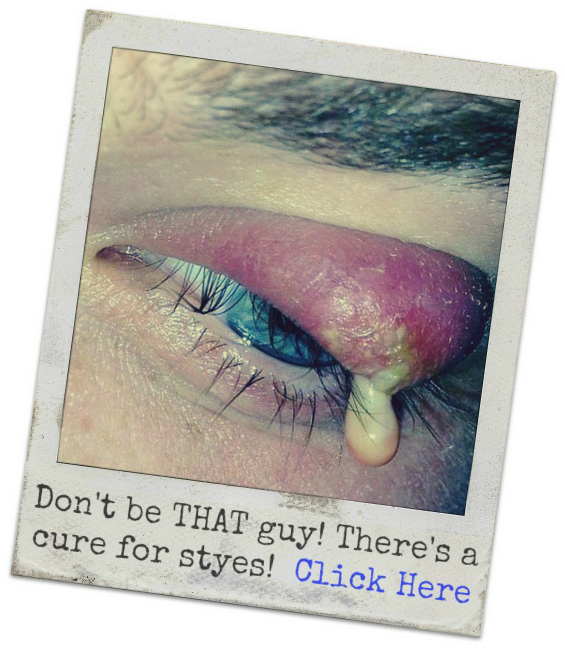 Styes generally last 7-14 days if untreated and 1-2 days if treated with the proper stye medicine. If a stye isn’t treated with proper stye medicine, full oil gland blockage can occur, and the stye becomes a chalazion. Styes are similar to a chalazion (also known as chalazia or meibomian gland lipogranuloma). A chalazion is a slow growing cyst of the eyelid that's caused by blockage and swelling of an oil gland. Chalazion treatment consist of a warm compress for 10 to 15 minutes, five times a day, to promote drainage of the clogged gland and reduce swelling. A chalazion can last a month or more and often requires a small surgical procedure to remove it. The first signs of a stye is slight pain when blinking, followed by eyelid swelling and crusting around the eyelids. As the abscess expands, a small yellowish spot appears at the center of the bump—similar to a boil or pimple. This small yellowish spot is the edge of the pus filled sac. Styes are generally harmless and rarely cause complications to the eye. However, they often recur in the same eyelid (top eyelid or bottom eyelid) or in the adjacent eye. Sometimes a stye can reoccur several times within a short period. It’s not uncommon to have two styes in the same eye at the same time. A stye usually heals within 14 days by reputing. The swollen area containing the accumulation of pus breaks through the eyelid causing an instant relief of symptoms. If the abscess doesn’t burst, the stye becomes a chalazion and surgery might be required for treatment. If conditions worsen after 10 days, seek medical advice from your doctor. Prognosis is better if one doesn’t attempt to puncture the stye’s pus sac prematurely, as the infection can spread to surrounding tissue. It’s recommended to seek a physician if you experience blurred vision, the stye reoccurs or bleeds, the abscess become extremely painful, or if the eye or lids become red. The baseline tear production glands in the eyelids produce the tears that lubricate our eyes. These aren’t the same glands that produce emotional tears. A dry eye condition causes these glands to work improperly, resulting in the baseline glands to become plugged. If plugging occurs, a stye can form. Prevention is closely related to eyelid hygiene. By performing regular eyelid scrubs, it’ll remove the dead skin cells that bacteria feed on. Place a few drops of baby shampoo into a small cup of warm water and mix. Using a cotton swab, gently clean the base of your eyelashes in a side-to-side motion. Other preventive measures that are designed to stop a stye from occurring again include the application of a warm compress. Two or three times a day, apply a warm washcloth to the surface of the eyelids. This will help liquify the matter in the abscess and encourage drainage. Caution: do not apply to much pressure with the warm compress. Applying to much force against surface of the eyelid can clog additional oil glands and cause a new stye to arise. To prevent recurring styes, never share cosmetic makeup and cosmetic eye tools. Always clean cosmetic eye tools with hot water and soap before use. If you suspect the cosmetic makeup has become contaminated, discard it. Additionally, eliminating stress may help to prevent a stye from occurring. The best stye treatment includes medication and and a variety of at-home self-care measures, such as warm compresses and eyelid scrubs. For at-home self-care treatment, cleanse the affected eyelid with a nonirritating baby shampoo or soap mixed with lukewarm tap water. Then thoroughly clean the edge of the eyelids with an eyelid scrub or a Q-tip. Cleanse the eyelids gently and while the eyes are closed to avoid eye injury. If the stye doesn't resolve within 14 days, a medical professional will often lance the stye to accelerate drainage. Doctors might also treat persistent styes with antibiotics, such as amoxicillin, chloramphenicol or erythromycin. However, these antibiotics mostly prevent secondary eye infections and provide little healing effect on the stye. If the stye ruptures, the patient should give medial care to the wound to prevent reinfection. It’s highly advised patients do not lance the stye, this can cause a serious eye infection. Oral antibiotics are often administered before a stye is lanced to avert a multiplication of microorganisms from entering the surrounding tissue and causing a severe infection. People who suffer recurring eye styes should avoid wearing eye makeup and contact lenses, as this can spread the infection. Medical treatment provided by a doctor is aimed at relieving symptoms. Anti-inflammatory drugs such as ibuprofen, the pain relieving drug acetaminophen, or antibiotics may be prescribed by your doctor. Antibiotics is often given to patients who suffer from rosacea, blepharitis, or people with styes that don't heal. Generally, the optometrist or ophthalmologist will prescribe oral antibiotics only when the infection has spread. Topical antibiotic ointments can also be administered for the treatment of styes. Surgery is considered the last resort in stye treatment. If topical ointments, antibiotics, and at-home medical care therapies fail, the doctor will surgically remove the stye. A ophthalmologist performs the stye surgery under local anesthesia by making a small incision on the outer or inner surface of the eyelid. After the incision is made to the stye, the pus is drained from the gland, and sutures are used to close the lesion. Stye complications are rare. The most common complication of styes is the development toward a chalazion. Frequent chalazions can cause cosmetic deformities and generally requires surgical removal. Additional compilations include disruption of eyelash growth, scaring arising from incorrect surgical lancing, and lid deformity. Styes that grow very large may cause vision interference.